Your children love the interaction with their toys, so don't get boring toys and furniture that will cause your children to be bored with their atmosphere. 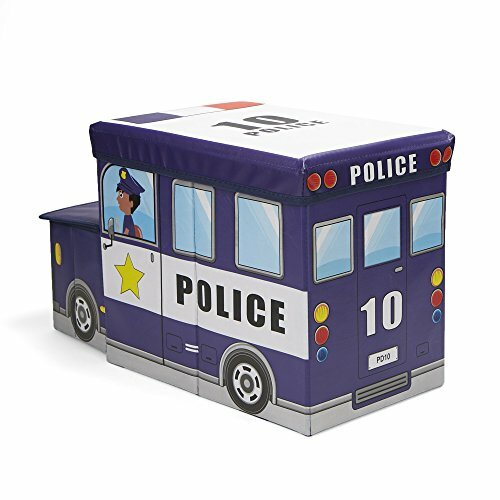 These new vehicle design stools will be the perfect accent for your children's rooms, and it can be used as storage for their toys. It's even foldable for easy put away storage. The Ultimate Storage Bin For Kids - Store your childrens toys, plush animals, kids clothing, books and much more. Comes in 5 designs; a school bus, ice cream truck, police car, fire engine, and a girls car. Multi-Purpose - Not just for organizing toys and childrens stuffed animals, it also doubles as a sitting stool. Safe for small children from 2-5 years old to sit on. Construction - Made of high quality material that is water resistant, enviromental protection and zero formaldehyde. Comes with high density paperboard that allows the stool to stand upright and withstand your childs weight when sitting. Portable Children Storage - Take it on the go if your child wants to bring some clothing and toys to a friends house or grandparents home. Simply take it apart and go! It is extremely light weight to carry with anywhere he/she goes.